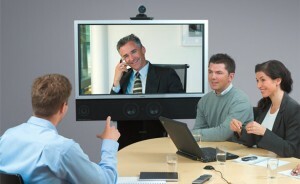 Video conferencing has become ubiquitous in both the workplace and at home. Services like GoToMeeting, Webex, Vidyo, Facetime and Skype used with a webcam, tablet or Smartphone make it inexpensive and easy to hold virtual meetings with almost all the benefits of an in-person meeting. However, looking good on video requires different considerations than face-to-face meetings. Wear clothes that are simple in design and pattern. Busy stripes and prints will appear blurry and distracting on video. Do use gestures to make a point. Don’t wave hands wildly or frequently. Video conference calls are a great tool for closing the distance gap between you and your team and customers. Used properly, you can create an experience remarkably similar to an in-person conversation. Speaking for impact on video is not an accident – it’s a skill. Share you favorite tips for video conference calls by submitting a comment to this post.